Mahina Tocker – musician, singer, songwriter, lesbian mother – is of Ngāti Raukawa and Tainui descent. Most of her music is directly about her being a Māori woman, and her songs are also gifts to her young daughter Hinewairangi, telling her of her language and her heritage. Mahina explains how the album came about. “Lesley Smith from Emmatruck Music wanted a woman’s record made and she asked me to do it. She’s an engineer who is learning the ropes and she’s working with Paul Streekstra. I really admire what she’s doing, and the energy that’s there from the other women is so supportive. 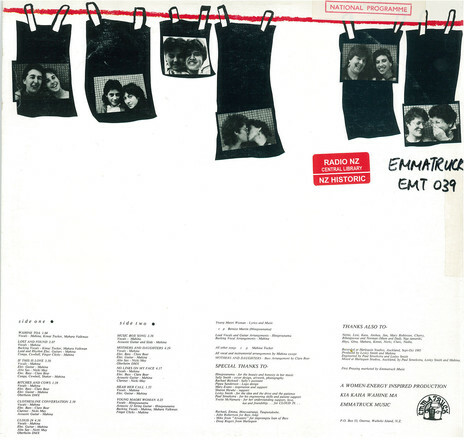 Cover of Mahinaarangi Tocker's 'Clothesline Conversation' album (Emmatruck, 1985). We talked about the new album and how she wrote quite a lot of the songs a long time ago and some were brand new. I asked about the song that gave the album its name, ‘Clothesline Conversation’. The story is part of Mahina’s own life. The original poem was written for four years before she realised that she had subsequently lived her own words. The music has been written in the last year. Original lyrics/poem included with Mahinaarangi Tocker's 1985 album 'Clothesline Conversation'. Each instrument in the song works in a different rhythm to all the others, and prior to going into the studio to record the song Mahina had heard the full piece only in her head. Mahina is on guitar, percussion, lead vocals and harmonies on the album. The other performers are Clare Bear on bass, Nicky May on clarinet and saxophone, and Kimai Tocker and Mahara Valkman – Mahina’s sisters – on vocal harmonies. There is also one song which is not Mahina’s. ‘Young Māori Woman’ is written and performed by Hinepounamu, and Mahina and Mahara perform backing vocals. “I’m not into standing up and making big speeches, but I say how I’m feeling about an issue or in my life in songs. Takes away a hell of a lot of explanation and verbalising the emotions! The music itself often provides the emotions even if you don’t fully understand what the words are about. All of my songs are love songs in one way or another. A protest song is still a love song to me. To say that something makes me feel sick or that I hate something means I must love something else. To be anti-war means I love life. Long ago I knew there was something for me that was really relevant. 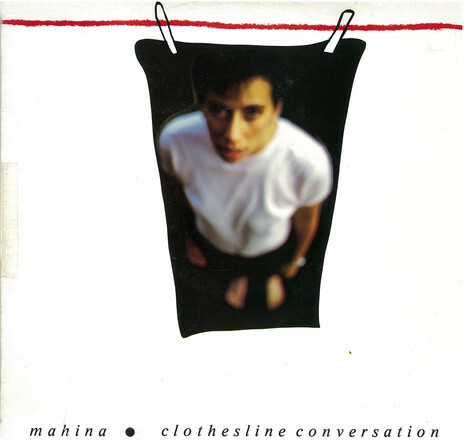 Back cover of Mahinaarangi Tocker's 'Clothesline Conversation' album, recorded at Harlequin, Auckland, 1985. “It’s only now I can say that my vessel for communication is music. I find it really hard when people ask what a song means, because it’s so individual. People can take from a song what suits them. It’s important that they keep what makes sense to them – rather than me tell them what it means - because I’m not like everybody else. They have to hear it themselves and feel what they feel. Jess Hawk Oakenstar is a widely traveled solo guitarist/singer/songwriter and “one-woman band” who was born and raised in Zimbabwe. During her 10 years in New Zealand, she was part of the Web Women's Collective that released the compilation album Out of the Corners in 1982. This album featured recordings by women such as The Topp Twins, Mahinaarangi Tocker, Diane Cadwallader, Hilary King, Val Murphy, and Hattie St John. Currently living in Arizona, Jess performs solo and with a duo, Wayward Maggie. © Jess Hawk Oakenstar – published with her permission. First published in Broadsheet, November 1985.